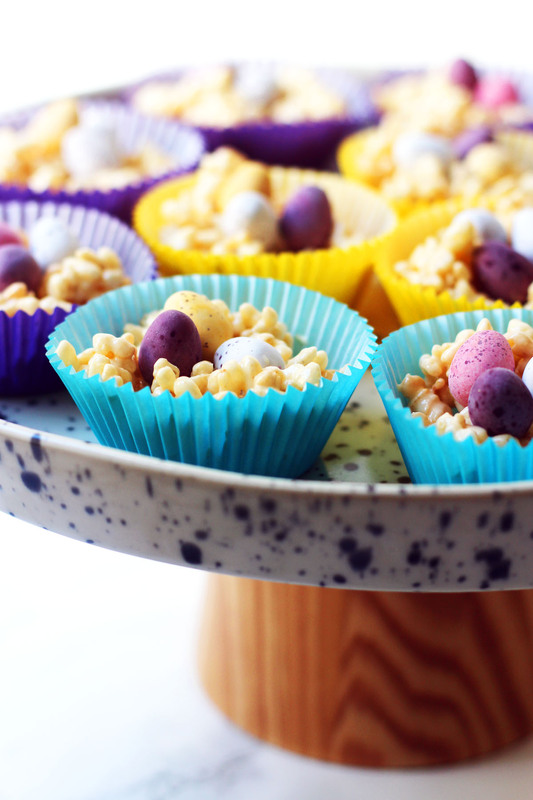 Marshmallow Easter Nests are a fun alternative to the traditional chocolate rice krispie nests. Scroll down for my simple recipe. In the UK kids are given two weeks holiday over the Easter period and I’m pretty sure its tradition in houses up and down the country for the kids to make a batch or two of chocolate rice krispie nests during the Easter holidays. I may be childless and 26 but I’m not afraid to admit that it’s still a tradition to make rice krispie nests in our house too! With just two weeks until Easter I’m sure this won’t be the only batch of Easter Marshmallow Nests that I make this year. Now don’t get me wrong, I love chocolate, but there’s plenty of that around at Easter so over the last couple of years I’ve lent towards making mine with marshmallows rather than chocolate. 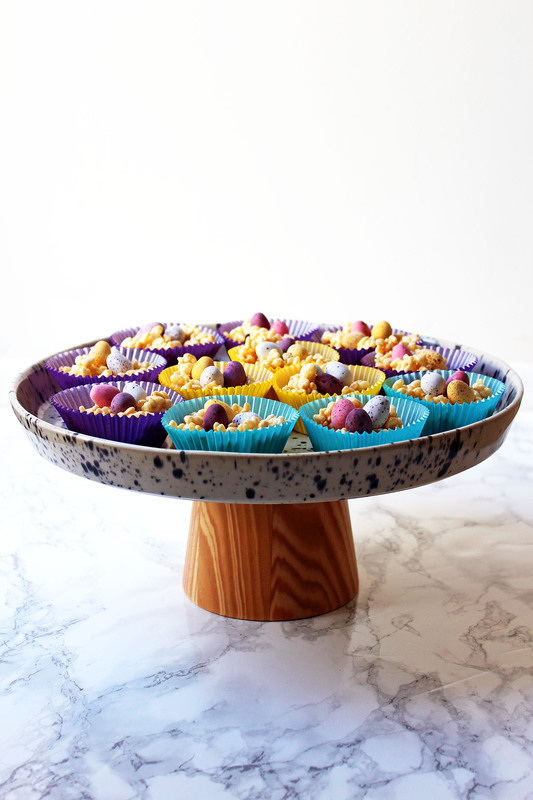 These straw coloured nests are sticky, sweet and only require 4 ingredients, plus the mini eggs you use to top them! 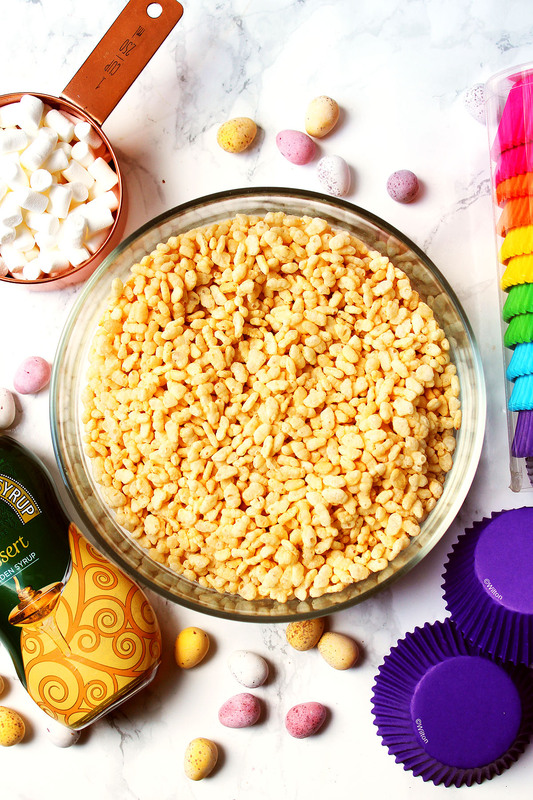 Marshmallow Rice Krispie Nests are fun to make whether you’re 5 or 50 and they are super quick to make so there’s no excuse not to have a batch ready for Easter Sunday. Easter Marshmallow Nests are a classic Eater treat loved by the whole family! Melt the butter a pan with the marshmallows and stir. Keep the heat low and add the golden syrup when the marshmallows begin to lose their shape. Gently stir the mix until a thick sticky liquid has formed. Immediately pour this over the rice krispies and stir. Working quickly so that the mix doesn't set, spoon the mixture into paper cases topping with chocolate mini eggs or marshmallows. If you’re looking for more Easter baking ideas you’ll find an epic Chocolate Easter Cake, Easter Lemon Sponge Cake, Creme Egg Bundt Cake, Traditional Simnel Cake and of course those Chocolate Orange Hot Cross Buns on the blog – just click here. In the meantime, if you like this recipe please make sure you pin it for later! Happy Easter everyone! LOVE marshmallow nests! I made chocolate marshmallow ones this Easter. Your cake stand is lovely too! You can also search for Chocolate Coconut Easter Nests on AllRecipes.co.uk and a few variations pop up! I hope that helps! Oh yes, chocolate crispie nests are a tradition here even though my lot are all now pretty big (and they are just as messy) – I’ve just been given a bag of veg friendly marshmallows so I’m going to have a go at your recipe, I’ve always fancied marshmallow nests, there’s enough chocolate around already! I’m glad I’m not the only big kid around here 😛 let me know how you get on with the veggie marshmallows – I wonder if that will affect them setting? Might even help! Such a basic but classic recipe. A favourite among kids and adults, alike! I love how sticky and gooey the marshmallow version is… I’m SO making a batch with the boys this week – need to get them away from the wretched PS4!!!!!! Definitely! Mking krispie cake is so much better than playstation! These are absolutely adorable and will be a sure hit in a few weeks! Can’t wait to make them for the Easter holiday! These are adorable! What a cute idea for Easter! These are so cute. I bet my niece and nephew would love to make some of these at easter. They are so much fun to make with kids! These look adorable and sure to be a hit in the Easter basket. I am sure that not only the kids will be excited to get them!